Our 2012 Digital Workplace Business Case survey showed that senior management concern about the potential cost of investment in technology infrastructure is one of the main barriers to the digital workplace. 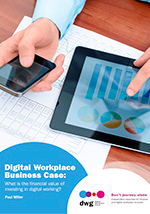 This briefing paper collects the known and proven hard financial benefits that flow from investing in the digital workplace. Free. Please refer to the DWG Research Terms & Conditions of Usage before download.